Background & Objective: Notoginsenoside R1 (NGR1) is one of the main effective components of Panax notoginseng. Method: Primary cortical neurons were harvested from neonatal rats and cultured to analyze the role of NGR1 in neuronal growth and the effects of NGR1 on the Wnt/β-catenin signaling pathway. Following treatment with NGR1, immunocytochemistry was used to detect expression of Tuj1 and MAP2, and RT-qPCR was used to measure mRNA levels of key factors in the Wnt signaling pathway. 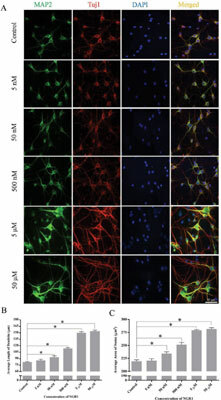 Results: Results showed that NGR1 promotes growth of cultured neurons and significantly upregulates mRNA levels of β-catenin, Dishevelled, and Frizzled. To further confirm whether NGR1 promoted cortical neuron growth via the Wnt/β-catenin signaling pathway, we knocked down β- catenin mRNA by siRNA interference; following NGR1 treatment of β-catenin-knockdown neurons, β-catenin mRNA levels increased significantly. Conclusion: In conclusion, these results demonstrate that NGR1 promotes growth of cultured cortical neurons from the neonatal rat, possibly via the Wnt/β-catenin signaling pathway. Keywords: Wnt/β-catenin signaling pathway, β-catenin, NGR1, growth, cortical neuron, RNA interference. Keywords:Wnt/β-catenin signaling pathway, β-catenin, NGR1, growth, cortical neuron, RNA interference. Abstract:Background & Objective: Notoginsenoside R1 (NGR1) is one of the main effective components of Panax notoginseng.